#OHLDraft The @OHLBarrieColts select Jacob Tortora in the first round. - Very Barrie Colts | A website covering the Barrie Colts of the OHL. Home Barrie Colts blog Draft Jacob Tortura OHL #OHLDraft The @OHLBarrieColts select Jacob Tortora in the first round. #OHLDraft The @OHLBarrieColts select Jacob Tortora in the first round. The Barrie Colts have selected Jacob Tortura at #19 in the first round of the OHL Draft. 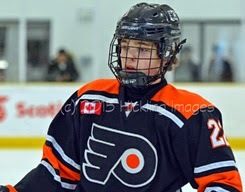 Jacob Tortora is a left winger that comes from the Don Mills Flyers. Only stands 5'6 and weighs 140 lbs. Born in Victor, NY. Colts do not have any picks in the 2nd round but have 2 early in the 3rd round. Be sure to follow us for updates.